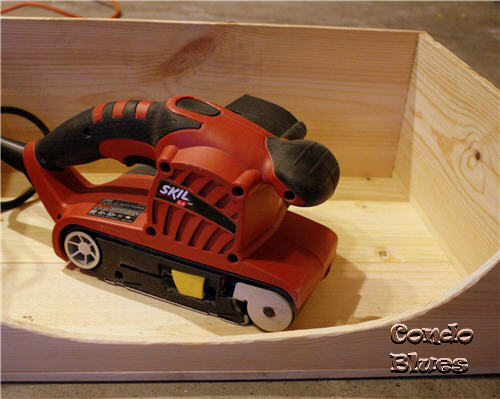 At the time, I whipped up a quickie toy box from a cardboard box. I took the opportunity to try covering the box with wrinkled brown paper bags. Eh, not much to look at but it works for now I thought. I fully expected Blitzkrieg to stress chew the box. Then I would take the opportunity to replace it with a proper toy box later. Don't tell Lisa, I have toys hidden all over the house - hee! Blitzkrieg didn’t chew his toy box to bits. Although he now knows toys are for playing with and chompin’! 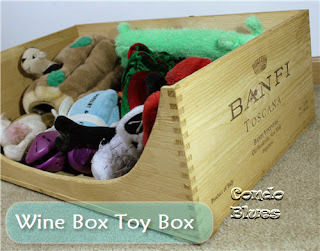 It is about time I upgrade Blitzkrieg’s toy box in the living room. I got a wood wine crate free for the asking from our favorite wine shop to make the toy box as a Christmas gift. I did not have time to do the project in time for Christmas. 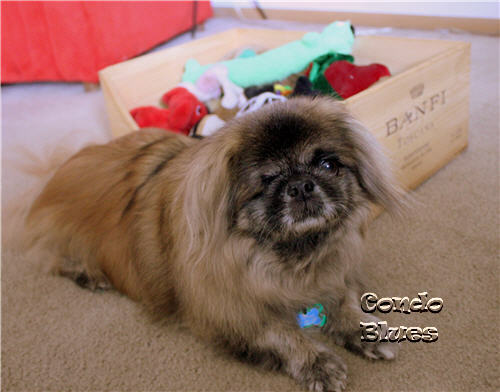 If there is one thing about canine cancer, it reinforces the Do It Now principle. My boy is getting a proper toy box. 1. I want an opening in the front of Blitzkrieg’s toy box so he can easily access his toys when the mood strikes. I stink at freehand drawing. I cut the front off Blitzkrieg’s old toy box and used it as a template to draw the toy box opening on the front of the crate with a pencil. 2. I cut along the pencil line with a jigsaw. 3. I sanded the opening scoop smooth with a sanding tip using my Dremel. It’s a wavy sanding job and one I’m not quite happy with because I didn’t use the right tool for the job. It would have been best to hand sand it. I used the Dremel because I am out of regular sandpaper and tried to cut a financial corner. I might have made up for it if I used a router but we were having a not so great dog health day the day I did this project. 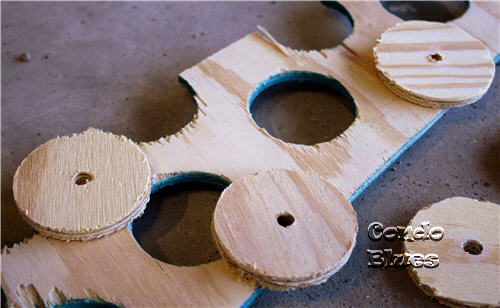 I needed this project as distraction and thought it best to limit my use of power tools that day. Let's pretend I added a little character to the project instead of bad technique, K? 4. I knocked back the roughness of the outside and inside of the wood crate by sanding it with 80 grit sandpaper followed by 120 grit sandpaper with my belt sander. Our new neighbor wandered over expecting some Guy Time with Husband because he heard tool sounds coming from the garage. He did a double take when he saw me covered head to toe in sawdust and sanding away with the belt sander. True story. 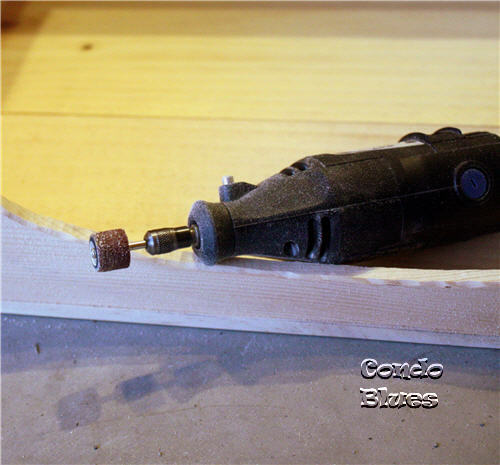 I could have cut square and mitered feet from scrap plywood with my compound miter saw or purchased something similar at a craft or home improvement store. 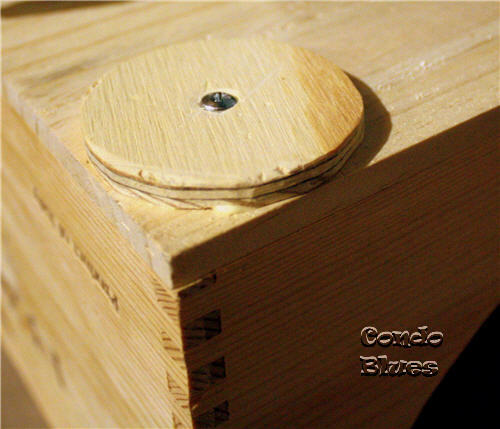 Using a hole saw isn’t the recommended method for cutting a pretty solid round object (as opposed to cutting a round hole in wood.) Hole saws are designed to cut a nice looking and round hole in a piece of wood and not the wood round as you can see from my photos. I went with this method because it was free from my scrap pile. 6. I waited for the wood glue to dry before I tea stained the toy box. I chose tea because I wanted a dog safe wood stain. I used four coats of tea wood stain. I like how the tea wood stain tweaked the wine crate to a nice honey color. 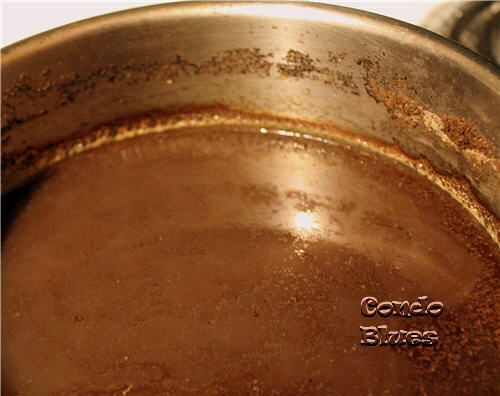 The color will naturally deepen over time. 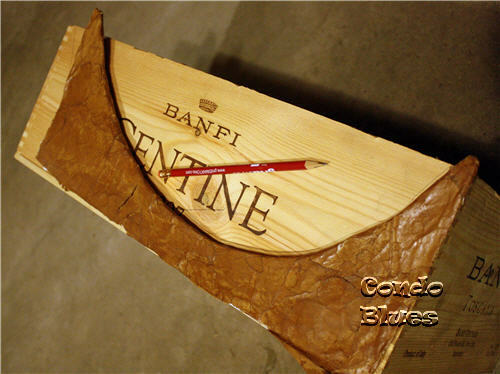 Come back to Condo Blues for a full wood tea staining tutorial! Looks like Blitzkrieg is a chip off the DIY Woods tree. 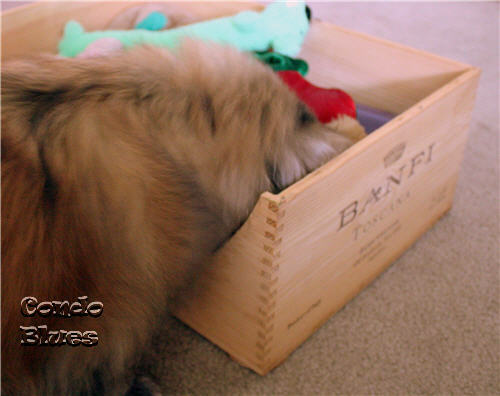 I let him check out his new wine crate toy box. 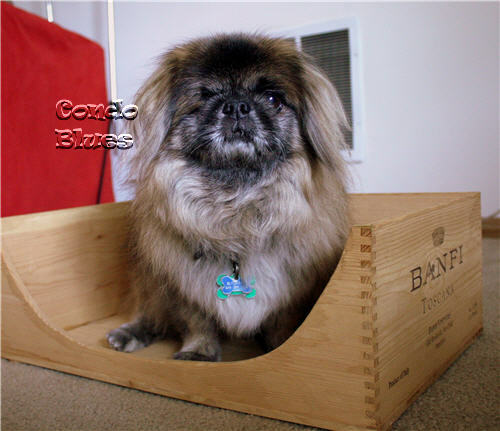 Blitzkrieg promptly turned it into a wood wine crate dog bed. If you put a pillow in here, it would make a sweet dog bed! 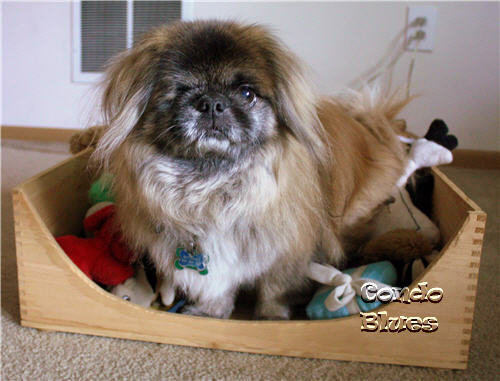 I put his toys in the new toy box. What would Blitzkrieg do? Comfy too. I like it. Thank you Lisa! You are welcome Blitzkrieg. I hope you enjoy your new toy box. Oooh I love this idea! Where did you get the wine box? Such a nice idea. Love it, now I need to drink wine and get a dog! lol Hope Blitzkrieg is doing well. I got the wine box from Palmer's Carryout. Emily says they get a lot of requests for wood crates but they will set them aside if you ask. You don't have to be Pinky the bulldog's BFF like Husband to get a crate. You are so crafty! This is great! 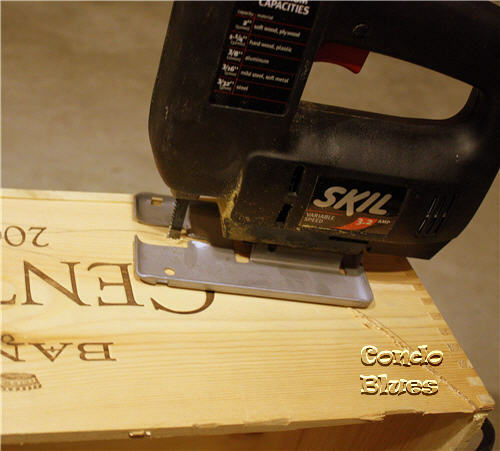 Perfect use for an old wine crate. Snuggles for Blitzkrieg! Looks awesome! What a good doggie mama you are. What a funny coincidence! I just got one of these boxes from Sam's last night! I didn't know what I was going to do with it, but I just thought it was so fun...this is a great idea though! Thanks so much for linking up to the Naturally-Nifty Linky Party! This week's party is up and I would love for you to stop by and link up! This is so cute! 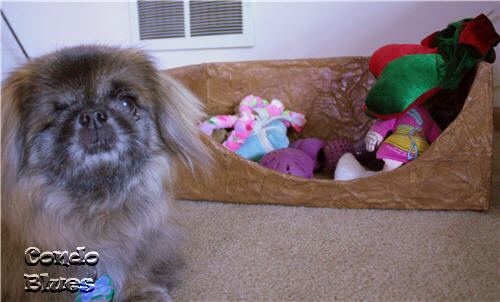 A lucky little doggie:) Thanks for sharing at The Winthrop Chronicles. Blitzkrieg is adorable! And the new toy box/comfy seating area is so cute! Fun idea and great job, Lisa! So smart and I bet Blitzkreig loves it. I'll pass this on to my parents who have some of these wine crates at home, to make one for their cat. Thinking of you. Pet Blitzkreig for me! Lisa, this is really adorable! I love that it is the perfect size for Blitzkreig ;-). Now, if only I could find a wine crate that is big enough for a 50lb. English Shepherd ;-D.
Thanks so much for joining in the DIY Talent Parade! Lisa! 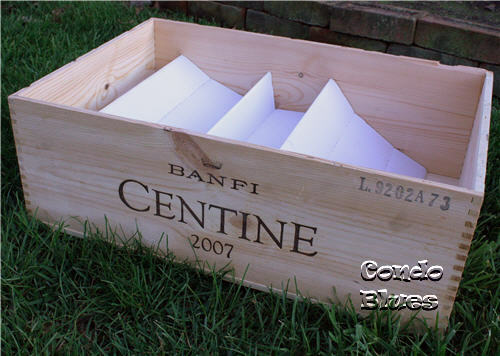 Thanks so much for sharing your ideas of how to use a wine crate!